"It would have been about 15m away from us at that stage…and as I looked across it was running back into the scrub on all fours (after it was) standing up. "My wife said 'that was a bear...that was hairy' and I said 'that is just plain weird'. "At first I thought it was a person in the shadows but then it dropped on all fours and went back out into the paddock." Doyle is a hunter and said "it was nothing like I'd seen before". "It was black with long hair. It would have been around 80 or 90 kilos…with a normal sized head in comparison to us. It didn't take off at any great speed. It just loped off." Doyle said he was later stunned to learn of a sighting in the region 12 years earlier. The QT reported on the sighting by a Mrs Crouten near Mulgowie in 2001. Harrison went out on location to interview Mrs Crouten at the time, who was working as a cook for a local doctor and was driving home at night. Mrs Crouten saw the creature just outside of Mulgowie in her headlights as it was walking on all fours. She was reported as saying that it was covered in hair and "looked like a large version of an Orang-utan". She was famously quoted as saying that "it had a distinctive monkey's bottom". Shaken, she called the police and was regarded by the senior constable who spoke to her as a credible witness. "That was a life changing experience for her and she was pretty shaken up about it," Harrison said. "Then the police got involved, it all hit the media and she laid low. "It is a relatively small community and once word got around about the Mulgowie Yowie it was pretty much common knowledge. "With the added reports over the years it has added to the hype." Harrison said the yowie could be a homo erectus, thought to be an extinct species of hominid. Others suggest it may be some form of prehistoric ape. "They are said to be extinct but there are so many sightings, almost daily, that can't be ignored," he said. "It has been happening ever since white settlers arrived here. We are told by the Aboriginal people about the hairy man in the bush and we thought it was a ploy to scare us away. "But as we were building roads and towns in virgin forests we were seeing them all around the country at the same time. "They were reporting back to London that we had our own indigenous primate. "I think their genes are very strong and that they might have a life expectancy pretty close to ours. Maybe not as long as ours, because if something goes severely wrong they can't go to the doctor." Harrison had a terrifying encounter with a yowie at Kilkivan, near Gympie, an incident that saw him bruised from head to toe. He shared images of his injuries with friends which have since gone viral on the internet. "That was a game changer. I can't go back into the bush by myself. I just got hit with a big dose of reality," he said. "I nearly got taken down by one at Ormeau in 1997 and that was really scary. "It was only by the grace of God that I survived. "I made a phone call at 11pm in a clearing before going into the bush and if I hadn't I wouldn't be here today. "This thing really meant business. But the cruncher was in 2009 at Kilkivan and if a few guys weren't there to rescue me I wouldn't be here. "That took a good eight months to get over. "The scary thing is that yowies have a massive advantage over us because of their eyesight in the dark. "The thing that knocked me over ran down a hill in pitch darkness past obstacles, tree, and logs. The angles were so steep but it sprinted down. "It didn't miss a beat.The one that chased me at Ormeau was the same." Australian Skeptics executive officer Tim Mendham said the case for the existence of yowies "comes down to the evidence and the quality of the evidence". "At the Australian Skeptics we run the gamut of saying 'that is feasible' to 'that is highly unlikely'," he said. "There would be few things that we would say are absolute, one hundred per cent rubbish. "But the yowie would be towards the 'improbable' end, because of the lack of real evidence. "People will say that they have got footprints or photos that are not particularly good and are open to other interpretations. "You reach the stage where there are possibility and probability issues. "To me on both those scales it is unlikely…just because of what we know at the moment." Harrison said getting a photo of a yowie was easier said than done. "We have some sketchy photos but nothing fantastic," he said. "Things are going to change in the future because people have dash cameras now and cameras on their phones. "When you are out in the bush and have an encounter and your mind is trying to register what this thing is, it has taken off. "You don't have time to get your camera out." 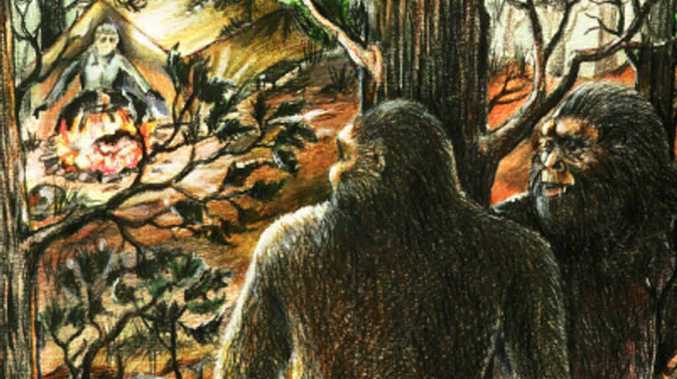 Mendham and the Australian Skeptics are after more evidence before their skepticism about the yowie decreases. "This is something that is unusual and you would need a certain size population of these creatures to sustain their existence," he said. "You can't just have a one-off, unless they live forever. "So you do need a population and there has to be more than two. You need a large family or tribe. "Once you have that number of individuals you would expect to have a lot more contact - whether it be photographic evidence, which can be faked, or droppings. "You'd maybe need some sort of evidence of what they eat. "Looking at some of the evidence on Harrison's site there are footprints which look decidedly unreal. You'd think with that number of individuals there would be better evidence by now. "The fact that we have increasing human habitation in these areas and an increasing number of people going through these areas…including bushwalkers…the suggestion that there is no better evidence than there might have been 20, 30 or 40 years ago indicates it might be something else." Mendham is not a stick in the mud, and does have a wry view of the yowie. "At the Australian Skeptics we deal with a lot of fun things like UFOs and we also deal with deadly serious things, like quack cures. "To me things like the yowies are fun, unless you are a homeless person being eaten by one. "These creatures, if they exist, don't seem to do a lot of harm. They are shy and run away. Not that I am saying that they exist." Harrison would disagree about yowies being harmless but he does agree there is an enduring attraction to the creatures. "Everyone loves a story about the yowie. Everyone loves a mystery don't they," he grinned. Marborough: mystical city of yowies?